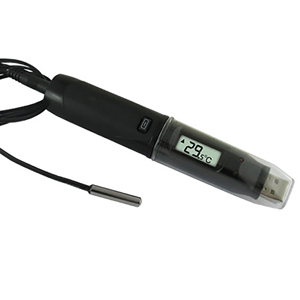 The OM-EL-USB-TP-LCD standalone data logger measures and stores up to 32,510 temperature readings from the supplied thermistor probe which is attached via the socket at the base of the unit. The user can easily set-up the logging rate and start-time, and download the stored data by plugging the data logger into a PC’s USB port and running the included Windows software. Data can then be graphed, printed and exported to other applications. The data logger features an LCD display and pushbutton which allows the user to cycle through the most recent, highest and lowest stored temperature readings. The data logger is supplied complete with a long-life lithium battery, which can typically allow logging for up to 6 months. The OM-EL-USB-TP-LCD is suitable for a wide variety of applications including high and low temperature monitoring, transportation, food processing, building and site monitoring and HVAC. Windows software is supplied free of charge with each data logger. Easy to install and use, the control software runs under Windows XP, Vista, 7 and 8. The software is used to set-up the data logger as well as download, graph and export data to Excel. The software allows for the following parameters to be configured: logger name, temperature units (°C, °F), logging rate (1 sec, 10 sec, 30 sec, 1 min, 5 min, 30 min, 1 hr, 6 hr, 12 hr), high and low alarms, start mode (immediate, delayed and push-to-start logging), display mode (display off, on for 30 seconds after button press, or permanently on) and data rollover (allows unlimited logging periods by overwriting the oldest data when the memory is full). The probe supplied with the OM-EL-USB-TP-LCD uses a precision thermistor to sense the temperature. The probe length may be extended by the use of a suitable extension cable (use twisted pair with high quality 3.5 mm jack socket/plugs for best results). Status Indicators (LEDs): Red and green LEDs. The first LED flashes red to indicate that the OM-EL-USB-TP-LCD is in an alarm condition (logged temperature has exceeded a high or low alarm level). The second LED flashes green to indicate that the OM-EL-USB-TP-LCD is logging normally and is not in an alarm condition. Nota: Comes complete with Windows software and operator’s manual on CD, protective cap, mounting bracket, 3.6V lithium battery and standard thermistor probe. • No FX1D, FX2D or FX3D can be used as a ship method. • Only UPS1, UPS2 or UPS3 is authorized. • For International shipments UPS and DHL can be used. For DHL internationally – Omega only has permission to ship Lithium Batteries no other Hazardous Material.